Going into the new season, what kind of expectations do you have for yourself this year? Going into the 2015 season my expectations are to try my hardest and do my best. I have trained very hard this off season and got myself into really good shape and feel ready to take on the challenge of Production A and ProAm. Reflecting on last year’s racing, what did you focus on most for the off-season in order to improve for 2015? Last year was a really good year and a learning year being it the first on my 450. I focused this off season on my strength in the gym a lot. I felt like last year my stamina was great but the new, bigger machine was a lot more for me to handle. I didn’t feel like I would get out of breath tired, I just felt like I would get physically tired and felt like if I was a bit stronger it would help a lot. That’s what I focused on a lot this off season. Phil Oppen, alongside girlfriend Miranda Williams and her son Kellen Williams, will be heading East this year. All the way from Estacada, Oregon to, well, all over the East Coast. 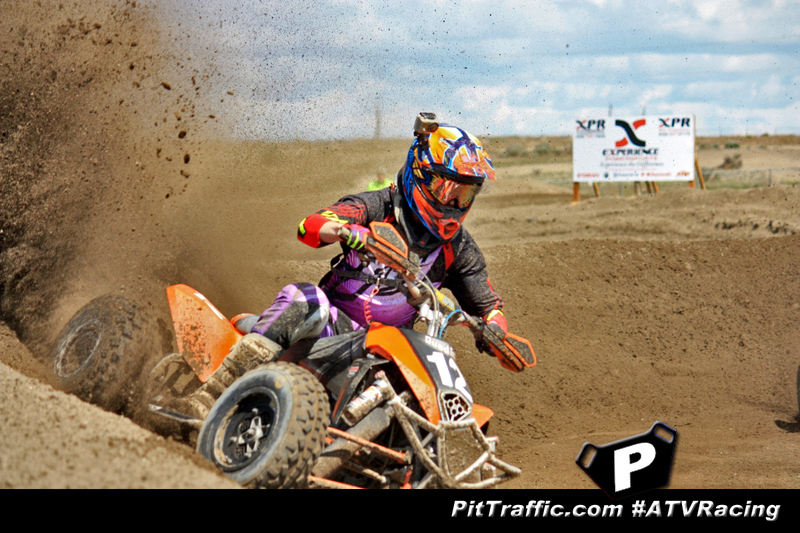 Phil and familia are pursuing the ATV MX circuit this year. After getting a small taste of the competition at the ATV Pro Challenge, Phil traded his truck and trailer for a big dogger tractor trailer combo last Spring and has been putting countless hours into making the rig ready for the upcoming MX season. We asked him a few questions about his upcoming adventure. Tell us about your racing plans this year. You’re heading back East to compete on the National Level. Are you excited? Nervous? Ready? That is true, it is something I have wanted to do since I started racing and this year I finally have a chance to go throw some laps down over there. I am very excited to be able to have this opportunity and feel well prepared for the season ahead. When did you first think that racing back East would be possible? Well I was kind of feeling out the work situation last year to see if there was a way to make it mesh. Also, we were having a tough time fitting everything we needed into our last set up, so after I found the semi, it was a done deal. Did you maybe get bit by the “bug” at the ATV Pro Challenge? Absolutely I did, it was a level of racing that I had never experienced. It made me realize that I can and will need to push myself a lot closer to the edge than I ever have. You didn’t get much seat time in last year. How prepared do you feel you’ll be for your first round? I have probably lost a little speed from not riding very much last year, but I have been working on my fitness a lot and feel confident in myself that I will be able stay in the front of the pack. Chris’ new 250 Hybrid. He needs graphics and a few parts yet! What’s your favorite part about riding? Jumping is my favorite because I like going far and getting air. My heart feels good! Can you tell us what it feels like when you are on the line, waiting for the gate to drop? I’m excited and ready and everything feels good. What are your racing goals for this year? Learn to race a big quad, place top 3 in my national classes, win [repeat] local and regional championships, start racing in a big quad class, & help others like me to race. Do you like riding the 450? How is it different than your mini quad? OH YEAH! The sound, the shifting, the speed, and power. It’s bigger too. What’s the best part about going racing? How did you come to the decision to move into the Pro class? I came to the decision when I realized I needed to push myself more, and what better way than pro? I want to give everyone in that class a good race this season! What are you bringing to the Pro class? You didn’t have “breakout” year as a ProAm. Well, I’m riding more and more. I’ve ridden more than I have last year already. I hit the gym earlier as well as found some proven supplements to aid in my workouts. I feel unbelievably comfortable on my KTM now and I just lose track of everything besides me and the quad. Tell us about last year, your first racing a 450. How was the transition from your 250? Was there anything you would have liked to do differently? My biggest obstacle last year was my size. Big bike small rider! I have been working out as often as I can in preparation. But overall I was very comfortable by the end of season. I can’t say I would do anything different. I had a good transitional year so I’m happy with the results. What did you learn by the end of the season that you wished you had mastered at the beginning of 2014? Power management. The 450 has so much more power then I was used to with the Raptor 250. Ruby Davis locked up the 2014 Quadcross Pro championship last year to both applause and a few critics thinking he didn’t earn it because the turnout was low in the Pro class. 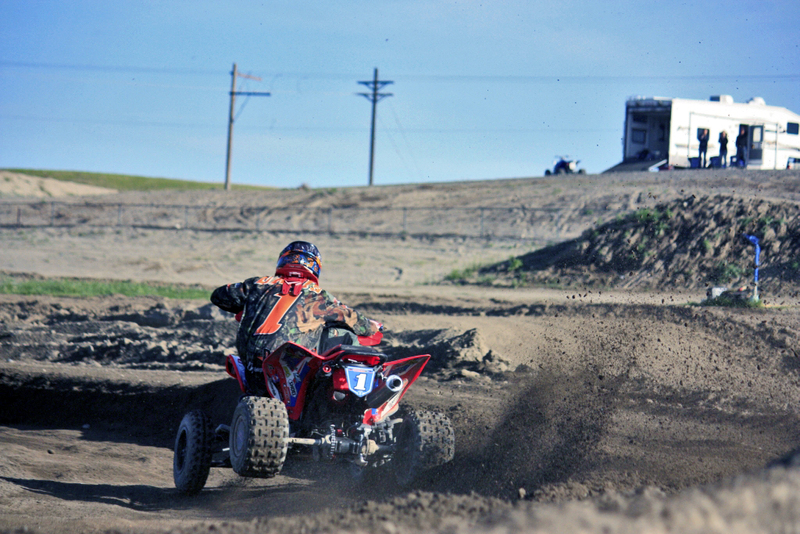 Ruby started to prove the critics wrong by competing in the stacked Pro-Am class, then he took the trip to Texas for the ATV Pro Challenge where he finished just shy of the podium in the ProAM there (no Pro class available due to adverse weather) against top names in the national ATV MX scene. And now, he’s the first Pro to take on the challenge of defending his QXNW Pro title. And he’s not backing down from the challenge. Armed with new sponsors and the same rosy outlook on racing, Ruby is putting his hear and dedication in his season this year and you can expect him to be at the top of the box when the dust clears. Tim Furches started racing ATVs in 1985. 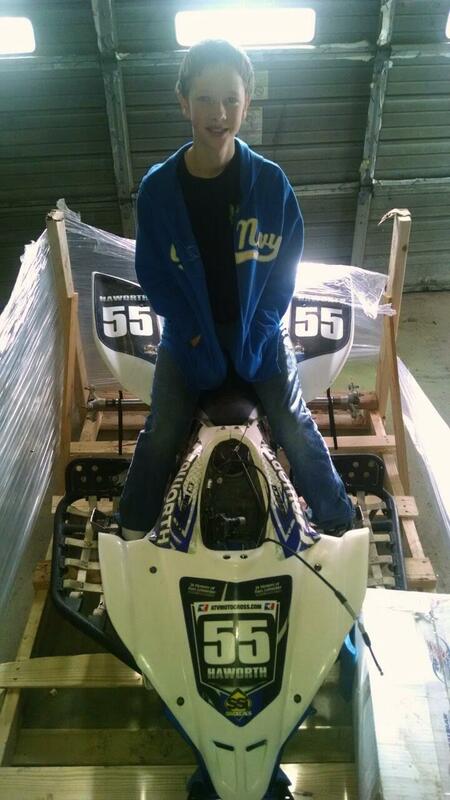 He was introduced to the sport of ATV MX & TT racing by his boss and his best friend. He raced at both the local and national levels. Tim and Stephanie, who always had an interest in motorcycles and ATVs but was never introduced to them, met in March of 1994. Tim had his 1987 Honda 250X in the back of the truck the very first time they met. Over the next couple of weeks Stephanie because engrossed with it. She quickly learned to shift and ride his quad. They married in October 1994. Racing was hard because they only had one quad. Tim continued to race locally and for the nationals both Tim and Stephanie were able to race. Then in the Fall of 1995 they made a tough decision. Stephanie raced a Poker Run where she wrecked and was seriously injured. “It affected us in many ways and we both made the decision to hang it all up,” Stephanie said. Now, they are back in the family as they support their son Chris’ career. Chris has autism, and you can read part 1 of this story here.